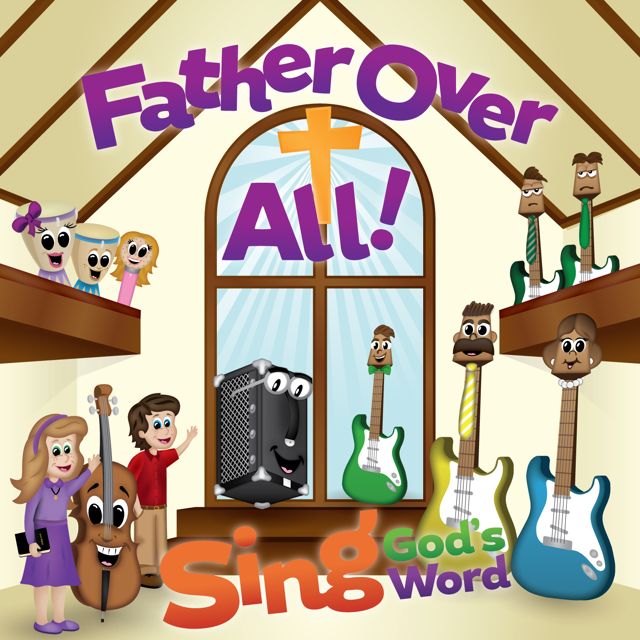 Scripture CD #4, Sing God’s Word – Father over All! Sing God's Word - Father over All! is our fourth CD. The songs and story line are predominantly from New Testament scriptures with one song from Old Testament Scripture and provide over an hour of entertainment. Continue to follow the adventures of Anthony, Kori, Matt Cello (M.C.) and many more musical friends from Symphony City. The story centers around Dilly Dissonance and his embarrassment of his three brothers (The Dissonance Brothers) who constantly make trouble for everyone. Also his relationship with his father is distant and practically nonexistent. At the end of the story Dilly begins to trust in God the Father and as a result his father asks for his forgiveness and their relationship strengthens. His father promises to spend more time with the family and to also curve the behavior of Dilly's three brothers. The specific links for the Lyric Sheets and the Coloring Pages will be sent to you by email once your purchase is complete. Tax (if applicable) and shipping and handling will be applied at checkout.